With 48 tracks and 18 different performers, this double CD is full value, not only for those like me who remember the 'folk revival' in the 1960s, but also for others who may not be familiar with some of the singers here who were rarely recorded. Many of these songs (or other versions) are well known but there are also a few gems that were previously unknown to me. The tracks are a variety of material including tune sets and monologues. As one would expect with live recordings, the sound quality is mixed, but the noise reduction of the sound files by Jim Ward is excellent. Only once or twice were 'noises off' a distraction. The singers are generally heard loud and clear amongst some audience participation. The recordings, with one exception, were made at the Kings Head Folk Club, Islington, North London. The included booklet may be found elsewhere on this site with details of the performers, songs and music. One drawback with reviewing a recording like this is that it sent me burrowing through my filing cabinets to look for 1960s folk magazines and other pieces of paper to remind me what was happening in the revival at that time. If you are a hoarder like me, you'll know that this can be a time consuming distraction! 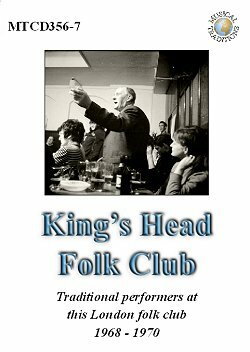 There's no doubt that the first two Keele Folk Festivals (1965 and 1966) gave a great boost to many of us involved in folk clubs at the time. Those who were there heard traditional singers from Ireland, Scotland and England for the first time; we felt this was 'the real deal' and were keen to find a place in the clubs for traditional music and song. They have a fine little band, but it tends to be a little noisy. They have used [sic!] such fine traditional singers as Fred Jordan, Jimmy McBeath, and Willie Scott. Performers are welcome and if you have a traditional bias, you will get a sing. This is not the place to revisit the (often heated) contemporary debates about the direction of the revival; suffice to say that the Kingston and Fox clubs were clearly the template for the Kings Head club. In the mid-1970s the first and second English Country Music Weekends, run by Rod and Danny (after they moved to Cricklade) followed the same pattern with great success. (it's similar to that sung by Wiggy Smith from Gloucestershire) and Young Taylor ( a poaching song) and Goshens Cockups, both known to Pop Maynard. Albert Shaw was a retired steelworker from the West Midlands, as can be heard in his powerful and lyrical voice. Apart from the familiar (Claudy Banks, The Horn of the Hunter) he includes a 1920s song, Lay Him away on the Hillside. This tells of the shooting of an Irish soldier, James Daly, in the British Army who led a mutiny while in service in India. The Irish 'outlaw' song The Wild Raparee Is another 20th century song that deserves to be better known. (here as The Banks of the Clyde), Died For Love and The Derby Ram (as Ramsey Ram) He was recorded by Fred Hamer in the 1960s and two of his songs were published in the book Garners Gay and recorded on the EFDSS LP1006 (released 1971) of the same name. The songs from Lizzie Higgins (including Betsy Bell) and Daisy Chapman (including the lovely Bunch of Violets) are also on their MT CDs (MTCD308 and MTCD335-6 respectively), but in different recordings. For those without these CDs they are well worth hearing. Phoebe Smith 's two songs Yellow Handkerchief/Flash Company and Game of All Fours can also be heard on the Veteran CD VT136CD. You might say this CD is a 'sampler' not only of the Kings Head but also of festivals and other events where traditional performers could be heard in the 1960s and 1970s. I welcomed the chance to hear again Margaret Barry and Michael Gorman, Freddie McKay (Three Flowers and a Billy Bennett Christmas parody) and also Tim Lyons' with Skibbereen. Busker Meg Aitken has two short songs; I'm not sure if she ever sang in a bar against a jukebox, but her voice would have won! Seamus Ennis, apart from tunes on uilleann pipes, introduces and sings Kitty from Balllinamore with what I can only call humorous venom! Percy Webb has six songs on the CD. Versions of Dark Eyed Sailor, The Faithful Sailor (a favourite in West Country sessions) and Rap a Tap Tap will be well known. The CDs also include items from George Belton, Oliver Mulligan and Terry Vosper. I would have preferred a tune or two from Bob Cann (we get Nobody Noticed Me); perhaps there wasn't a good enough recording? And I don't mind that Rod has 'cheated' by having Scan Tester's tune set (with singing) recorded at Vic Smith's Lewes club. It's a great way to round off the CD which I greatly enjoyed.